So to get back in the swing of things I'm just gonna try to post stuff, even if it seems really random. For instance, I was in a tea shop today - I mean a shop that sells tea, not a cafe - and I wanted to buy some of the flavoured teas. I was reminded that I'd actually need a tea pot (since it comes in leaf form not in bags). AHA! - I thought - I have a vintage coffee pot that could suffice, despite it being a little big. 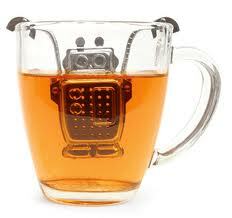 But then I'd also need a tea strainer which I don't have. 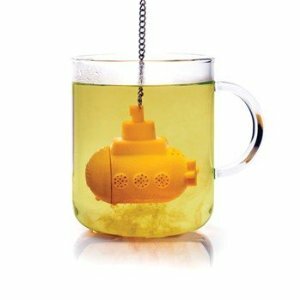 A tea infuser was then suggested, which I very nearly bought before realising that I was sure I'd seen some cooler tea infusers somewhere on 't' interwebs'. I am a tea drinker and have tea infusers but nothing so spectacular as these. Those are just too cute for words! @Bonnie Do you have plastic ones? I'm worried that the plastic would alter the taste. No mine are metal. No taste problem that I can appreciate.